Even though California's recently passed vaccine mandate, sponsored by sell-out politician Senator Richard Pan, doesn't go until effect until January 1, 2016, schools are already demanding that students be fully vaccinated or else be removed from the classroom permanently. The most disturbing part? It's happening in virtual online schools advertised as providing homeschooling where students complete all of their coursework at home. The only requirement is that they meet with their teacher in person four times a year through testing events, or voluntary school outings. The ultimatum was made when a Sacramento father received a disturbing phone call from his daughter's online school, California Virtual Academies, notifying him that, if his 7th grade daughter does not receive the Tdap (tetanus, pertussis and diphtheria) vaccine, she will be locked out of her online coursework indefinitely. CA doctors are now recommending family members and friends of a newborn, can not be around the infant unless they have a flu shot and DTAP updated due to the baby being at risk of getting one of these diseases from UNVACCINATED adults. For thousands of years, medical professionals and herbalists have proven that diseases are caused by a dysfunctional immune system not properly working properly and that herbs and healthy diets can improve the immune system. In CA, now, diseases are only spread form unvaccinated people. The truth is that vaccines make the person getting the vaccine a carrier of the disease she/he just got vaccinated for. Not only do flu shots lower immunity to many diseases, but over time, flu shots can cause Alzheimer's in seniors and paralysis and death. Flu shots, MMR, and DTAP shots are the number one payouts in Vaccine Courts after children and adults have become permanently brain damaged, paralyzed, or died from a vaccine shot. The more vaccines are given at one time, the greater the health and life risk of the patient. Proper hygiene, clean water, and proper nutrition creates a healthy immune system, not any vaccine. They only withdraw students who do not submit proof of tdap or vaccine waiver form. K12 is for profit, they would not withdraw if they were not required to by law. They should have just filled out the waiver. Virtual home schooling...over the internet. Someone needs to explain that the viruses that circulate over the internet are not the same as what the vaccines are given for. LOL! This demonstrates that when the liberals get control, they want full control, right now. It is absurd that they gave notice the same day that they lock the student out. This is a police state if there ever was one. God be with you are your kids as you sort all this out. I don't think this request was related directly to sb277. There was a more recent recommendation or "mandate" about 4 or so years ago to require 7th graders to get a booster for pertussis. They blow hard, but the truth is, the exemptions still work just fine and there is nothing they can do if you have a valid exemption. The exemptions have to be signed off by a medical professional, but you don't have to have a medical exemption. It just says that the dr. explained it all to you and you still do not want the vaccine. Its just a way to make it more difficult. Best of luck to you. Karen-Lyke said: > So how do we who understand the details about vaccines (ingredients, toxicity, real negative risks, dubious benefits, profit-based hype) join forces and a) awaken others to the BS about vaccines, and b) maybe bring a lawsuit preventing businesses from requiring vaccination or compliance with some other regulations as a requirement to do business with them. Maybe the recent Supreme Court statement prohibiting business from discriminating against LGBT would serve as a precedent? We also need to take this cute business move by pharma-vaccine to court and prohibit any business from mandating that everyone use its product. I'm with you on uniting and using the discrimination card. I just don't understand how they can justify allowing students that HAVE HIV or Hepatitis and other communicable diseases, yet disallowing perfectly healthy kids who "might" somehow magically contract a disease. It is ridiculous! We all need to make sure not to use the term 'immunization' when speaking about vaccinations. Vaccinations do NOT make you immune it's quite the contrary. I work for Innovative Education Management. 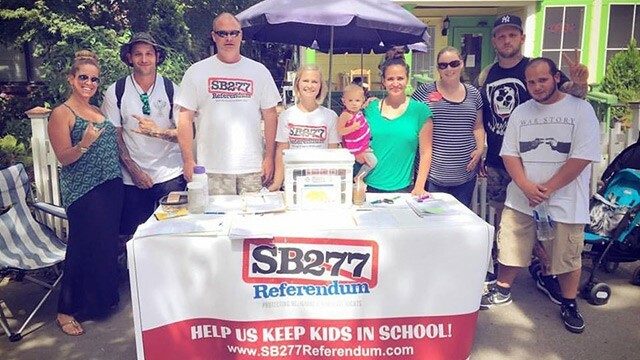 We run (free) home school charter schools in California and are very involved in the SB 277 debate. I would be happy to help you find a school that supports your desire to home school and respects your options as a parent. Please feel free to email me: crachel@ieminc.org We get a lot of students who have previously enrolled with CAVA. Ptalady said: > Unbelievable, but I do believe it because CAVA (the virtual charter school) told me the same thing! I called them because the new statute leaves home school as the only option, and CAVA ("K12") is the only free homeschool curriculum I was aware of. To me, it is impossible to discern whether it somehow reflects the school's own rationale, or reflects the terror many have of appearing to be "a rabid anti- vaccine wing-nut." The mandate covers private schools as well, but two virtual schools I contacted that we're based outside of California did not require vaccines (they actually sounded bemused by the notion that Vaccination status would even be relevant to their students). But they cost $5000 a year (not free). > > Shocking, appalling how blindly this vaccine bandwagon is attracting so much momentum. So how do we who understand the details about vaccines (ingredients, toxicity, real negative risks, dubious benefits, profit-based hype) join forces and a) awaken others to the BS about vaccines, and b) maybe bring a lawsuit preventing businesses from requiring vaccination or compliance with some other regulations as a requirement to do business with them. Maybe the recent Supreme Court statement prohibiting business from discriminating against LGBT would serve as a precedent? We also need to take this cute business move by pharma-vaccine to court and prohibit any business from mandating that everyone use its product. Unbelievable, but I do believe it because CAVA (the virtual charter school) told me the same thing! I called them because the new statute leaves home school as the only option, and CAVA ("K12") is the only free homeschool curriculum I was aware of. To me, it is impossible to discern whether it somehow reflects the school's own rationale, or reflects the terror many have of appearing to be "a rabid anti- vaccine wing-nut." The mandate covers private schools as well, but two virtual schools I contacted that we're based outside of California did not require vaccines (they actually sounded bemused by the notion that Vaccination status would even be relevant to their students). But they cost $5000 a year (not free). Shocking, appalling how blindly this vaccine bandwagon is attracting so much momentum.